The 2017-18 school year was remarkable in countless ways — from Husky Baseball’s first-ever trip to the biggest show in college baseball to a fifth consecutive Apple Cup win for Football to record-shattering academic performance. Here are just a few ways that the generosity of Tyee Club members helped build champions last year. Fall 2017 boasted all-time records in academic achievement: Twenty-one of our 22 teams earned a team-average 3.0 GPA or better, with three out of four student-athletes reaching or bettering that 3.0 mark. Fourteen student-athletes earned perfect 4.0s. Gymnastics set an Athletic Department record best GPA at 3.67 and Football, Softball, and Women’s Track & Field and Cross Country all set team record GPAs. 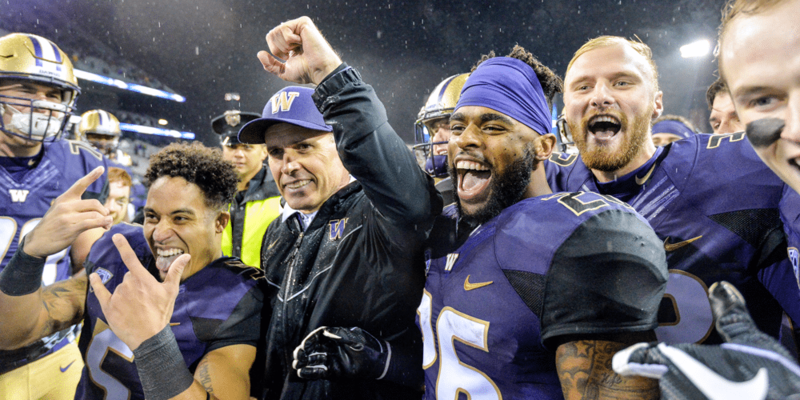 Washington Football took first place in the Pac-12 Academic Progress Rate — which represents a four-year rolling average of academic progress and retention — becoming the first team to ever beat Stanford. Men’s Basketball recorded its best season-to-season jump in wins in more than 80 years, finishing the season 21-13, including marking the biggest improvement in conference play in UW history. First-year Head Coach Mike Hopkins was named Pac-12 Coach of the Year. Men’s Rowing and Women’s Rowing each earned Pac-12 titles, with the Husky men winning the national championship and the women earning second at NCAA Nationals. Vita Vea, Dante Pettis, Will Dissly, Azeem Victor and Keishawn Bierria were drafted to play pro football following a season that saw the Huskies earn a Fiesta Bowl berth. Washington Softball made it to the final game of the College World Series before falling to Florida State. The Huskies ended the year with a record of 52-10, the third-most wins ever and their best record since 2010. Congrats to Women’s Tennis, Women’s Golf, Gymnastics and Track & Field, which all sent players to post-season play.